When a mobile phone sends or receives an MMS message, it makes an HTTP connection to an MMSC (usually through a WAP gateway). The MMSC contains an integrated HTTP server to process these connections. Please specify an available “HTTP Port Number” on the local computer for the HTTP server to accept connections from mobile phones. The PC that is running the gateway might have other web and mail services installed. For this reason, the gateway allows you to specify which of the available IP addresses on the current PC should be used by the gateway. The “IP Address” prompt displays the available IP addresses on the current PC. To make the gateway service available via any address on the current PC, select “(all available)”, otherwise select a specific IP address. “Local Host Name or IP Address” specifies the local host name or IP address of the computer that is running the MMSC service. The name or address specified here will be used to construct URLs when sending MMS messages to mobile phones. If a host name is used, this host name must be defined in DNS and resolve back to the computer running the MMSC service. “Domain Name for MMS E-Mail” specifies the SMTP domain name that is associated with users defined to the MMSC. When MMS users exchange e-mail messages with internet recipients, this is the SMTP domain name associated with the MMSC users. Note that the MMSC acts as an e-mail server, and you will need to configure DNS for this domain name so that internet mail sent to this domain name is properly routed to the PC running the gateway. When an MMS user sends a message to an SMTP recipient, the MMSC can either function as an “SMTP Smart Mailer” or it can route all outbound e-mail messages via an “SMTP Relay Host”. If “Enable SMTP Smart Mailer” is checked, the MMSC will perform DNS lookups to locate remote recipients and perform SMTP e-mail delivery. If “Enable SMTP Smart Mailer” is not checked, it is required that an “SMTP Relay Host” be defined. When the smart mailer is not enabled, the MMSC will connect to the “SMTP Relay Host” to send all outbound SMTP e-mail messages. If you are using an “SMTP Relay Host”, please define an appropriate SMTP mail server in your network that will perform this SMTP message relay capability. Checking “Enable POP3 Server” enables the POP3 Server. 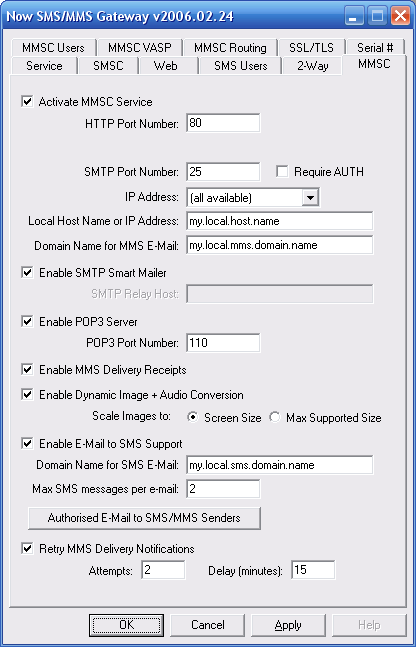 The POP3 server allows user accounts defined in the “SMS Users” dialog to connect via the POP3 e-mail protocol in order to receive SMS or MMS messages (and connect via the SMTP e-mail protocol to send SMS or MMS messages). More information on this setting can be found in the E-Mail to SMS/MMS Connectivity. The standard “POP3 Port Number” is 110, however it is possible to use a non-standard port, if desired. Checking “Enable MMS Delivery Receipts” should be checked if MMS delivery receipts should be supported by the MMSC. When an MMS message is sent with a delivery receipt requested, the MMSC generates a delivery receipt back to the sender when the message is delivered. In some installations, it may be desirable to disable delivery receipt capabilities. Checking “Enable Dynamic Image and Audio Conversion” enables the dynamic content adaptation and conversion services of the MMSC. The MMSC uses WAP/MMS “User Agent Profile” capabilities to determine the MIME formats that a device supports, as well as the maximum size of images supported by the device. Where required, the MMSC converts between common image formats (including, but not limited to GIF, JPG, PNG, BMP and WBMP) to deliver an image supported by the device. For images larger than the maximum size supported by the device, the MMSC will automatically scale the image to fit the device, speeding up download times. For audio formats, conversion between WAV and AMR is provided in the e-mail gateway interface. MIME types not supported by the receiving device, which cannot be supported, will be removed prior to delivery to the receiving device to prevent compatibility issues and unnecessary download delays. The “Enable E-Mail to SMS Support” checkbox enables the SMTP interface to be used to send SMS messages. This setting is used primarily in conjunction with bulk e-mail delivery via SMTP Authentication, as described in the “SMS User Accounts” section of this document. Gateway user accounts can be allowed to login via SMTP with an e-mail account to perform bulk delivery of SMS messages. If this configuration setting looks out of place, it is because this SMS gateway capability is provided through the MMSC’s SMTP server. When enabled, specify a “Domain Name for SMS E-Mail”, so that the gateway can identify by the domain name of the message recipient whether to route the message via SMS or MMS. Additionally, specify the “Maximum number of SMS messages per e-mail” to be used when converting from SMTP to SMS. When set to a value greater than 1, the gateway will use long (concatenated) SMS messages to support messages longer than 160 characters. The “Authorised E-Mail to SMS/MMS Senders” can define a list of users and/or domains that are allowed to send messages to SMS or MMS recipients via the MMSC. For more information on this setting, please see E-Mail to SMS/MMS Connectivity. Checking “Retry MMS Delivery Notifications” tells the MMSC that it should periodically retry sending MMS notifications if a recipient of an MMS message has not retrieved the message from the MMSC. As discussed in How MMS Works, the MMSC generates an MMS Notification message when it has an MMS message to be delivered to a recipient. This MMS Notification message is a WAP Push message that is usually sent over SMS. It is assumed that the SMSC that is delivering this notification message provides reliable delivery. However, in some instances, it may be desirable to configure the MMSC to retry sending the MMS notification message, in case of a problem at the SMSC or receiving device. To enable these retries, check “Retry MMS Delivery Notification”. Then specify the number of “Attempts” that the MMSC should make in retrying the MMS notification, as well as the “Delay” interval (in minutes) between attempts. Note that the MMSC will apply a progressive delay, increasing the delay with each attempt, such that the actual delay interval is the configured delay interval multiplied by the number of previous notification attempts. As an example, if “Attempts” is set to 4, and “Delay” is set to 15, the first retry attempt will occur after 15 minutes. The next attempt will occur after 30 minutes after the previous attempt, then 45 minutes after the previous attempt, then 60 minutes after the previous attempt, after which no further notifications will be attempted. 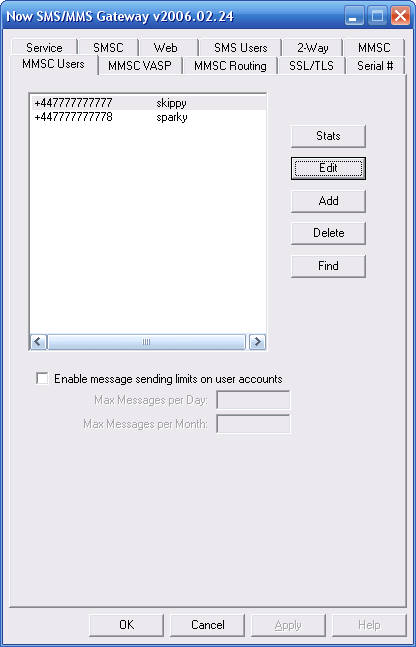 It is also possible to configure the MMSC such that it if an MMS message is not retrieved from the MMSC within a configurable timeout period, the MMSC will then convert the message to SMS, sending a text SMS message to the recipient, with a URL like that can be used from either a phone or PC browser, to retrieve the content of the message. To enable this SMS conversion, it is necessary to define an “MMSC Routing” of the type “Convert to SMS web Web Link”. Specifies the name of an MMSC Outbound Route that is defined in the “MMSC Routing” list, which must be of the type “Convert to SMS with Web Link”. By default, if an MMS message has not been retrieved within 120 minutes, the message will be rerouted to be sent as an SMS with a web link for accessing the MMS content. #### is a value in minutes that changes the time period after which the UnderliverableRouteToSMS setting is applied. The “MMSC Users” configuration dialog defines users that are allowed to utilize the MMSC. Note that for a mobile phone user to use the MMSC, the mobile phone user must configure their MMSC (MMS Messaging Server) to point to the address of the MMSC, and include their user name and password in the MMSC URL. The username can be either the user’s alias name or phone number. For service provider configurations, it is possible for the MMSC to read the user’s phone number from the network automatically, and to automatically provision MMSC user accounts the first time a user sends an MMS message. More detail on this configuration can be found in the Technical Bulletin titled NowSMS MMSC Operator Considerations.